Flattery will get you a Pizza. Flattery will get you everywhere, or is that nowhere? Flattery is often associated with obsequiousness or false praise. But for the hard-working cook, a little flattery, a little praise, or just a heartfelt ‘thank you’ goes a very long way. I remember those who dine at my table, the ones who say ‘thank you, I enjoyed that, it was really tasty’. I don’t care if they are telling the truth, although I sense that they are. I also remember those who either say nothing at all, or proceed to tell me how they, their wife or the restaurant up the road, makes a delectable version, remaining oblivious to the presence of the food on their plate and in their mouth. I distinctly recall laboriously making a rich, buttery pastry for a summer Charlotte, filling it with spiced plums and apples, and ‘taking the plate’ to a friend’s house to share with him and the assembled others, who had arrived plate- free, for lunch. As the host ate, he recalled the quince tart made by a mutual friend, whose pastry was so much shorter and how delectable it was. This story was related at length with a big spoonful of my **tart in his big ** mouth. I tried to disguise my annoyance, but I have never forgotten that incident. Another chap, enjoying a three course meal with us, spent the time breathlessly talking about his wife’s superb cooking and the wonderful things she makes. No praise for the meal, and only a meagre parting thanks. Don’t you hate that? 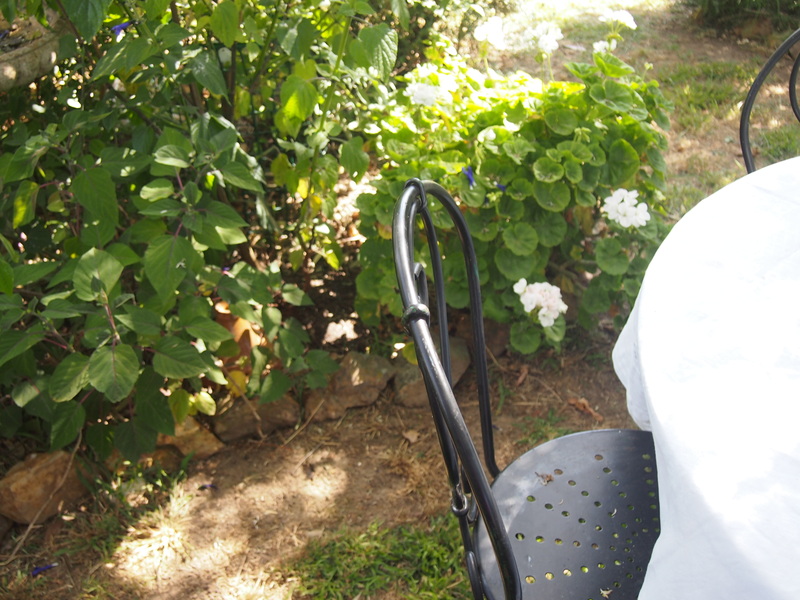 Then there is my lovely niece, Louise, who came to stay recently, and commented on every dish she ate – the yoghurt and stone fruit breakfasts, the home-made but stale bread, the soup, the Flamisch, the pasta, the broadbeans. She made proper Maeve O’Mara noises – Mmm, Ahhhh, followed by lovely text messages the next day. “Can you text me a slice of your sourdough,” was her latest amusing message. She is an excellent cook herself and certainly doesn’t need any guidance from me, but she requested my recipe for pizza dough. Since she is such an appreciative guest as is her hungry nine month old bambina, I am finally posting it. Warning, the recipe is short, but the post is long. Pizza dough from Carol Field’s Italian Baker, with a few variations. This dough is made in a stand mixer, and lists by cups then in grams. I prefer to weigh. You can make it by hand or in a food processor. Use cold water if using a processor. If using a bread making machine, use the dough setting and cold water, adding the water first. 1 1/2 teaspoons /7.5 g sea salt. Stir the yeast and sugar into the water in the mixer bowl; let stand until foamy, about 5 minutes. Stir in the oil with the paddle. Mix the flour and salt and add to the yeast mixture. Mix until the dough comes together. Change to the dough hook and knead at medium speed until soft and satiny but firm, about 3 minutes. Finish kneading briefly by hand on a lightly floured surface and form into a ball. Place the dough in a lightly oiled bowl, turn to coat with the oil, cover tightly with plastic wrap and let rise until not quite fully doubled. Depending on the weather, and the room temperature, this may take up to two hours. Shaping and second rise. Shape the dough with a rolling pin or by hand. Knead the dough briefly and gently on a lightly floured surface, for 1-2 minutes. Divide the dough into two ( this amount will make two large pizze). Roll each piece into a ball on a floured surface then flatten to a thick disk. 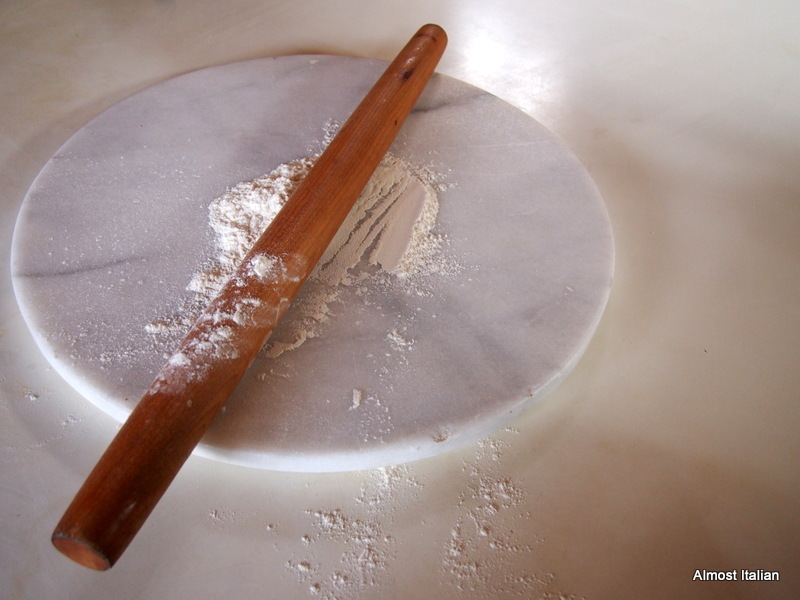 The easiest way to shape the dough is with a rolling pin*. Roll out thinly, leaving a cornicione, a thicker edge along the rim to keep the sauce in. ( The Cornicione is a favourite of babies, gastronomes and dogs named Bill). * My favourite pizza rolling pin, bought in an Asian Grocery for $6.00. Place the dough on large trays dusted with semolina or polenta and let them rise another 30 minutes, covered with a towel. Dress the pizze with your favourite topping. Turn oven to full ( 250c), and wait until the oven reaches that heat which may take 30 minutes. Cook for around 20 minutes. You can usually smell when the pizza is ready. It is done when the crust is crisp and golden brown. Remove from the oven and brush the crust edge with a little olive oil. Either place the dough on trays dusted with semolina or polenta, OR, roll the dough out on non stick paper and let them rise on the paper. This allows the trays to be heated in the oven, then you lift the dressed pizza onto the super hot trays. If using a pizza stone, you need to work out a way of transporting your wobbly pizza base to the stone. The simplest way is to make it on the paper, carry onto the stone, then slide out the paper at the 15 minute point when the pizza has firmed up. As I tend to cook two pizzas at once, the pizza stones seem like hard work to me. I simply use the ‘cooking paper method’ on pre heated trays. Flour in Italy commonly comes from the species Triticum Aestivum, which is divided into two major varieties, soft wheat and hard wheat, (grano tenero) – and from which all bread is made. Durum hard grain ( grano duro), or Triticum Durum, a different species, is the hardest wheat grown and is usually milled into semolina. It is a golden grain that has a higher protein and gluten content and is used almost exclusively for pasta production. The Italian baker has five grades of grano tenero to choose from, although they are classified not by strength and protein content like ours but by how much of the husk and whole grain have been sifted away. The whitest flour has the least fibre. The lower the number, the more refined and whiter the flour, so that of the five categories, “00” is the whitest and silkiest flour, “0” is a bit darker and less fine, since it contains about 70% of the grain, and “1” is even darker. Darker and courser is “2”. For all the talk of the prevalence of whole grain in the healthy Mediterranean diet, only a fairly small percentage of Italian breads are made with whole wheat (Pane Integrale)…Millers simply take refined white flour, stir in a quantity of bran, and pronounce it whole wheat. It is good to know a little about flours when we bake. I always use a local flour by Laucke mills ( South Australia) for Pizza baking. Wallaby Flour is described as a Bakers Flour due to the high 12% protein content. I check the date and make sure it has been recently milled. Laucke mills also produce an Australian ’00’ flour, a stone ground, organic wholemeal flour and Atta flour, the latter being great for Indian bread. A range of bulk wholemeal flours may be found at NSM in Brunswick, Victoria and a range of spelt and unusual flours at Bas foods, Brunswick, Victoria. I like the idea of eating local products: the wheat grown and processed in Australia means it is fresher and, as Italians are not averse to chemical use, purer. ’00’ type flour is too refined for Pizza but my dear friend Rachael uses it successfully by adding semolina to the mix, which would give it more strength via the higher gluten content. Sometimes I add 20% spelt flour to the mix for variation but I am mindful that a little extra water may be needed. Playing with different flours is always interesting and all recipes evolve over time. But, like Olive Oil, buy the local product. Thank you and a little praise goes a long way. Mr T receives praise for all his hard work, grass cutting and maintenance in the gardens and paddocks. He praises me for the food he eats. We take nothing for granted. Yes a little flattery does go a long way. My boys think they are on Masterchef and sometimes “rate” my dishes – I’m ecstatic when I get a 9/10. 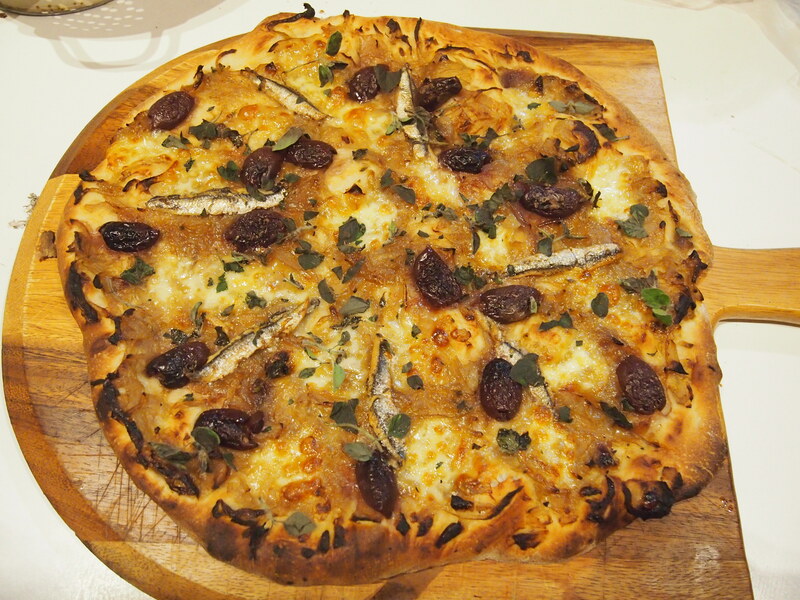 Your pizza looks awesome, I usually use plain flour as well rather than 00. So good that your boys are taking notice of the food they are eating and giving you ratings! Most kids either eat and run, or just complain. As for adults who say nothing at all, well, perhaps they are oblivious to the effort that goes into preparing a good meal. Ah, thanks Jess, you know what it’s like. yeah, those who don’t say thanks deserve a defrosted Coles brand sausage, cooked in bad oil, wrapped in white 90% wettex masquerading as bread from same supermarket. And a squirt of sauce. It’s funny how much Masterchef judging is being done in family homes! Apropos of my whinge about the media, this grumpy old dame says it’s just plain old fashioned good manners to sincerely thank the person who with effort has put a nutritious and delicious meal in front of you. Your comment to Jess made me smile but I think an empty plate would be more fitting. I have Carol Field’s Italian Baker, but have never cooked from it. Why? I use these proportions exactly for pizza dough which makes me wonder if my source failed to acknowledge her source many years ago. PS Your pizzas look fab!! I sometimes feel I’m getting grumpier so I am glad you mentioned old fashioned manners and a little respect for the effort taken in producing the meal. Yep, an empty plate for those other invitees who love to talk about someone else’s version of the dish, while eating yours without comment, and a spot on the black list. Thanks re praise for Pizza. The reason for the post was not only my niece’s request for it, but my son also asked for it the other day, expecting that he would find it on the blog! He throws the lot into a bread making machine. In the end, it is about minimal yeast. A bit more than a teaspoon per 1/2 kilo of flour is as much as my gut can take. And she is always polite. Some people have awful manners. Imagine saying something negative about the food that someone had prepared or served up! Even if someone blogs something that may not look nice, I always try and be encouraging. After all I don’t know what it tastes like! Lorraine, does this look like the cake you had at Lucio’s? It does indeed-thank you Francesca!! I adore this post Mrs Italian. A wee bit of gratitude for the love shown in a meal made, warms the hearts of those of us who endeavour in kitchen activities. Appreciating each other’s different strengths is a beautiful thing. 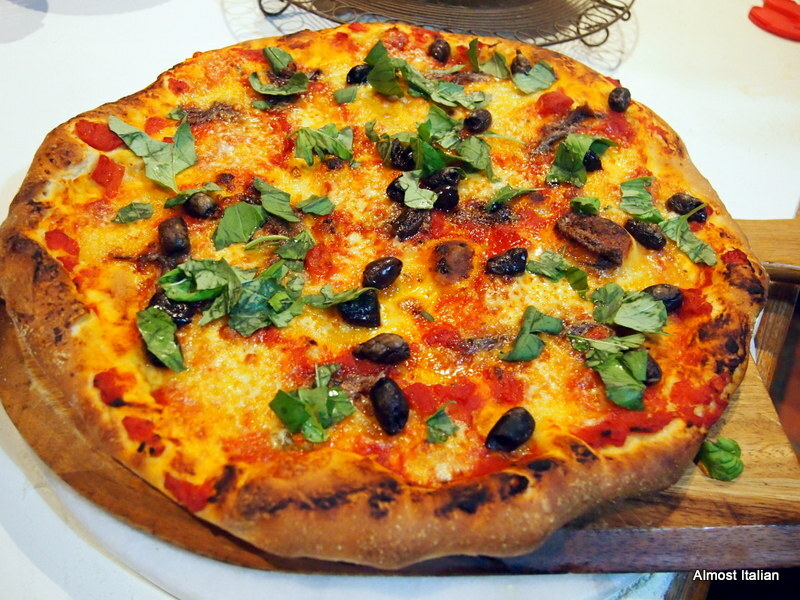 Your gorgeous looking pizza is making me hungry! Oh thankyou cheery one, it is true. Francesca, If I were lucky enough to eat at your table, there would be genuine flattery aplenty. I love all the things you make and have even recreated a few of your recipes in my own kitchen. My boys (husband included in that category) are suitably grateful for any delicious meal I present them – and have even gone so far as to mention (brag) this to their colleagues. Yes, flattery is necessary and does go a long way. And…is that an onion pizza at the end of the post? Yum! It is: I have used that pic before I believe and the onion confit was the buttery one, the recipe provided by you some time back. You are welcome at my table any time you’re passing through this neck of the woods. Yum! The G.O. and I were just last night discussing the demise of quality flour and ensuing products… as you do. So this info was very interesting. Being the main cook in our household, I tend to be eternally & possibly excessively grateful when someone prepares food for me! You deserve all the accolades possible and anyone crazy enough to eat by your hand who isn’t impressed, or even polite enough to express appreciation deserves to cook dinner for my Dad! LOL. That last comment made me chuckle. I know blokes like this, those who have been forced to change their diet and make comments such as these when forced to eat healthy foods. What annoys me about people who eat without thanks is their sense of entitlement, ie, ” I am doing you a favour by eating your food”. Preparation, cooking, cleaning up as you go can take hours – bending chopping, grating-. Those of us who do it know how exhausting it can be some times. This is why I have become more mindful of thanking Mr T for grass cutting, or repairing the malfunctioning dishwasher, and so on. Yep, Pumpkin Pasta on a plastic plate for your Dad sounds perfect. What a hilarious exchange, ladies! Love it. Mmmmmmm Pizza! Think I need to come up and finish the kitchen bench and double glazing. You are more than welcome- I’ll feed you anything you desire!!! as long as you bring your tools- no, not fair, I mean, you can eat here any time, really Mr Tool. What a wonderful post Francesca – I loved reading this! Pizza and appreciative manners – two of life’s most essential things! My girls and I made pizza just last night (a bit of a Friday ritual for us; and yes, it was the 00/semolina mix) and my eldest had a friend over for a sleepover. She complimented the base and then asked if I’d made the dough. Lovely!! She can come again 😉 Thanks for another great read – and your pizzas look incredibly good. Oh ok, great, Ill try it. My sister’s pizzas are indeed a treat. I recently was a recipient of Francesca’s wonderful food, having made an excuse to visit there after work. It was great to catch up with her and Mr T away from Christmas and other family gatherings. Sadly I could not stay long. Like Francesca’s son, I make pizza dough in the machine. It’s time thing which I don’t have a lot of. I am going to start experimenting with different mixes. It was lovely to catch up. Thanks for the impromptu visit- the best kind as far as I am concerned. And the lovely book of photographic memories.